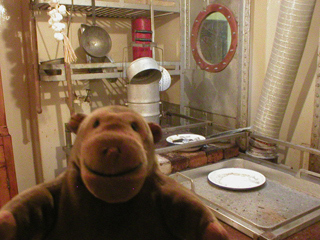 "Well, I've certainly enjoyed visiting SeaFront"
Mr Monkey had a look around the galley and the mess room where the crew of nine had their meals. 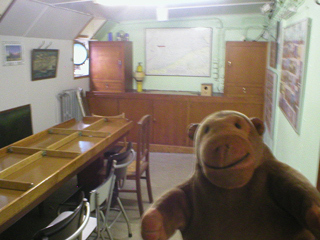 Mr Monkey was impressed by how much space they had, at least in comparison with the crew of the Foxtrot submarine. The crew were on duty for two weeks, then off duty for two weeks. As well as maintaining the light, they monitored the weather, passing birds, and water pollution. After he'd looked around the galley, Mr Monkey went out through a room which had been converted into a souvenir shop and left SeaFront Zeebrugge.